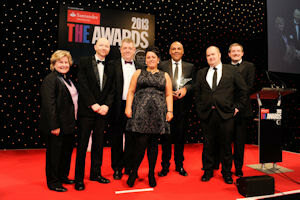 The University of Manchester won the Outstanding Contribution to the Local Community Award at last night’s Times Higher Education Awards. Now in their ninth year, the Times Higher Education Awards are a highlight of the academic calendar and celebrate the excellence and amazing achievements of institutions, teams and individuals in the UK higher education sector. The Shadow Minister for Universities, Science and Skills, Liam Byrne, joined universities from all over the country to celebrate the greatest ideas, the finest practice and the very best researchers and teachers. The glittering black-tie event was hosted by comedian Sandi Toksvig, and the University’s victory was witnessed by more than 1,000 people, who gathered at the Grosvenor House Hotel for the ceremonylast night. Manchester won the award for our initiative which helps jobseekers in neighbouring areas to improve their skills and employment prospects. As one of the largest universities in the UK, Manchester is a huge employer in the North West, but it is also close to some of the most deprived parts of the region. With this in mind, and a commitment to social responsibility, the University set out to use its influence to change the lives of local people for the better. The Works, which was developed by the Directorate of Human Resources, offers jobseekers in areas neighbouring the university, such as Moss Side and Hulme, help to improve their skills and, crucially, employment opportunities. This has been achieved through a partnership with other large local employers, including Royal Mail, Barclays and Manchester Metropolitan University, that ensures that a number of jobs at the university and beyond are ring-fenced for local people. As a result, since March 2011 more than 3,600 people have benefited from the support of The Works, which now runs from three different sites, and the 1,000th local unemployed person to find a job through the project was announced this April. Steve Grant, Assistant Director of HR at The University of Manchester, said: "This programme has positioned the University as an employer of choice amongst communities adjacent to our campus. We intend to build on this work which has led to the award and we look forward to working with other employers across Greater Manchester in furthering the development of this intiative and perhaps introducing others in the future." Sir Deian Hopkin, president of the National Library of Wales and one of the judges, called the programme “unique” for its direct method of helping unemployed people. Also short-listed for Outstanding ICT Initiative of the Year was MIMAS, the University-based centre which develops technology to make information available to those who need it for education and research. For more coverage of the awards, profiles of the winners, and photos from the evening, please visit www.the-awards.co.uk or pick up a copy of THE, available in newsagents from 5 December.